Balinese girls grow into women. Growth is going through a lot of experience and journey. Following the prevailing culture and traditions living environment. That emotion faced by women in Bali. Tradition in Bali is very strongly associated with the presence of women. Without women, the tradition in Bali would not maintained properly, it will likely become extinct due to changes in the era of increasingly advanced and filled with everything very practical. 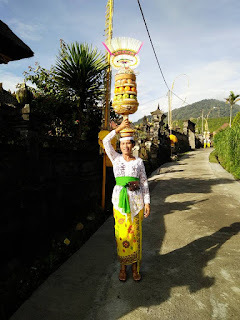 Women are the most important part in maintaining the tradition and culture in Bali. Bali has many unique traditions. So as to foster a culture that still exist today. Culture in Bali is one of the strengths of existence Bali as a tourist destination island were very famous. The unique culture that grow with the tradition, into Bali continue to improve and bring a uniqueness that can not be found in any country of residence, only in Bali and will continue to exist until the earth is destroyed. Balinese women ranging from children, girls, to grandmothers, all very instrumental in keeping the tradition and culture in Bali. They do a lot of things related to religion, ritual, and many things in the life of a family will consider the traditions and culture that has been passed to date. Women Balinese also be key in maintaining harmony in the life of the Balinese. Since childhood, the Balinese women have been taught to be alive and able to grow into the traditions and culture that flourished in Bali. Many of the activities of religious ceremonies and rituals involving minor female role in it. Young girls were taught how to maintain cultural traditions and, indirectly, the existence of culture and tradition that is maintained by the Bali since childhood. Although they did not realize what they have done to Bali. Men also have to keep the feeling and the pride of the women. For the attention of men to women is very important. If the woman feels humiliated, the culture and tradition in Bali will be destroyed quickly. Because of the cultural life in Bali is very complicated and difficult to do without the presence of women. Culture is a very important part to the existence of Bali. The tradition in various aspects of life must be maintained to keep growing well. If tradition and culture did not chime well. Then Bali will be abandoned by tourists. As tourism is the main income and the most promising of the citizens of the Balinese economy. Bali without tradition and culture will be the island without economic good. Bali without women would destroy the traditions and culture that has grown and developed long ago. Girl Balinese are rarely willing to work as bar girls. Because the image as bar girls are very bad. Although there are Balinese girl who works in a bar or cafe, they would choose a bar and a cafe with a good image. Bar which is providing a service to people who want to hang out, not the ones that come with lust and want to do nasty.